This (taken with my phone, I know its bad quality, sorry) is my addiction. I obviously made it to the yarn store. And got $40 worth of yarn! I’m so excited I just want to run home and start knitting. Years ago, at this same yarn store (its actually just a store that happens to sell yarn, not a dedicated yarn store), I purchased one ball of Austermann Step sock yarn. It had aloe and jojoba oil (or something) in it, and its super soft. I knit it up into socks this winter, and I’m in love. They stay soft wash after wash, and the self-patterning varieties of this yarn are stunning. Do you think I can find that yarn anywhere? NO. I walked in and was confronted immediately by an entire wall (!!) filled with yarn! Imagine my excitement. I could hear my heart beat in my ears and my eyes definitely bugged out of my head a little. There were so many types! When confronted with such an overwhelming situation, my brain tends to categorize and focus on the goal. 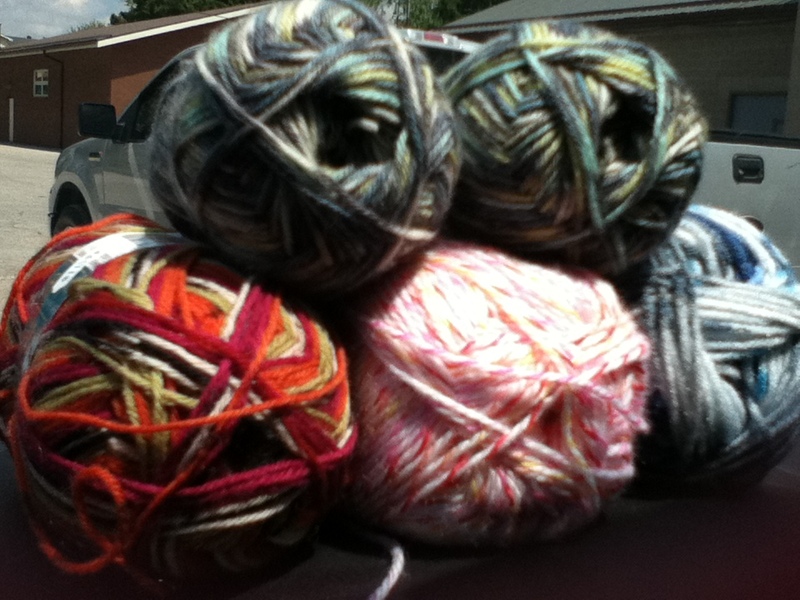 I immediately gravitated towards the sock yarn (since that was what I was there for) and stroked probably every skein. However, I spotted the sale bin, and my plans went out the window. I browsed through that for a little bit, but found nothing of interest. The sale bin was conveniently located beside a few shelves of my favourite yarn, good old Patons Shetland Chunky. They had many varieties, but unfortunately none of the variegated colourways that I’m fond of. Back to the sock yarn I went. I looked. I touched. I may have smelled. It was too much to drink in, and I admit that my senses may have been overloaded. My mind wasn’t working properly as I pulled ball after ball into my arms. I didn’t even question one $12 ball. I still don’t know what happened to my usually trusty frugality. I knew it had been too long since I visited the yarn shop. It was such an overwhelming experience that I’m sure I am going to have to go back again soon, this time with my wits about me. This means that I averaged purchasing a ball every two minutes, and for every minute I was there I spent $4. Good thing I had a time limit or my tuition money would have been out the window. Next thing you know, one of those reality shows about hoarding or addictions would have been knocking on my door.